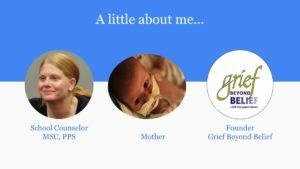 I started thinking about teaching professionals about how to provide appropriate support for grieving nonbelievers a long time ago. I can’t remember when I realized we need this; maybe it was when I discovered that the UC Berkeley Extension program in The Study of Grief and Loss addressed serving the grief needs of a variety of belief communities, but not us. I brought it up with a few professors and the blank looks on their faces spoke volumes. That was before one of them actually said that because psychology is a secular field, grief therapy is already devoid of religion. And therefore, the professor claimed, trained grief support professionals already know how to serve our population. This was in Berkeley California. 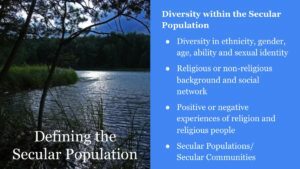 I started discussing the idea of me speaking on the topic of working with grieving nonbelievers with a staff member at The Minnesota Network of Hospice and Palliative Care (MNHPC) in the spring of 2017. 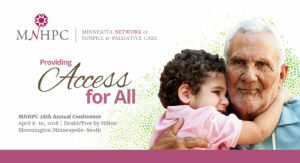 The website described their conference as the Midwest’s largest end-of-life conference. That actually made me giggle. But from the very beginning I wanted to do this. When I got the email saying my presentation proposal had been accepted for this year’s conference, I was thrilled. Yeah, I’m that person: I get excited about opportunities to talk about secular grief. But this was different from every other invitation. Usually I am talking to atheists about grief; this was a chance to talk to the people providing professional grief-support services about serving atheists and other nonbelievers. First of all, I learned that in some ways, things are worse out there than I knew. Within the first couple hours of the conference, I heard at least three statements from presenters that assumed religious or spiritual beliefs in patients and clients. It confirmed what Grief Beyond Belief community members in the Midwest and South have shared. Both before a death and following, grieving nonbelievers encounter professional after professional who feel completely comfortable assuming that everyone involved has some sort of afterlife belief. This is not to say that the session wasn’t useful to me as a counselor. It was a brilliant presentation by a professional with decades of experience in speaking with the dying and grieving, with participants who collectively possessed centuries of experience in this work. I took copious notes and will use what I learned both with the middleschoolers I counsel in my day job and with members of the Grief Beyond Belief community. I learned prompts like, “When have you experienced joy?” and “What did you admire most about your loved one?” Completely appropriate for our community and rather Humanist in feeling. Once the posters were up, I prepped my slides, planned with the staffer who would introduce me, and met the music therapist who softly played guitar as participants entered the room. I also took a lot of deep breaths. I haven’t been nervous about giving a talk in literally years. I had to remind myself that, as a speaker, I do my best work with a balance of nerves and confidence. I used a little positive self-talk, and more deep breaths. That deep breath stuff really works. The room filled. I counted. Over seventy people chose from eleven available breakout sessions to attend the one titled, “Providing Grief and Bereavement Support to Atheists, Humanists and Other Non-Religious People.” The audience included hospice staff and administrators, nurses and doctors who work with the terminally ill, counselors and therapists, and chaplains. A lot of chaplains. I started by introducing myself, my credentials, Grief Beyond Belief itself, and of course my son Jude, the little boy whose life and death inspired me to found the community. I also described some of the ways in which we differ from each other, such as a range of positive or negative experiences of religion and religious people. In addition, I made the distinction between people in secular communities and those who are grieving without faith but do not identify with organized atheism or Humanism or any other group or label. Finally, I made it clear that my expertise is in the grief of atheists and agnostics (whether or not they use those particular labels) not in the rest of the “nones” who have some beliefs in the supernatural, even though they are not religious. Next I gave the audience some time to read the quotes on the walls, familiarizing themselves with the experiences and needs of grieving nonbelievers. When we came back together, participants shared their thoughts. 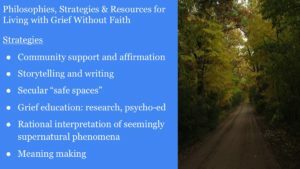 From comments like (not an exact quote), “I see a lot of isolation,” I knew that the audience was starting to understand that the assumption of faith beliefs and the lack of knowledge of our needs has an impact on those of us grieving without faith. 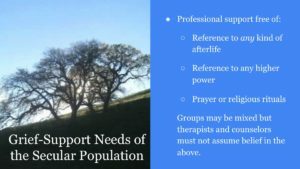 The quotes served to launch the section of the presentation in which I defined not only what grieving nonbelievers don’t want from professionals — prayer, pressure to believe in an afterlife — but what they do want — knowledge, strategies, and most of all a non-judgemental listener. The session ended with some time for participants to pair up and explore how their new knowledge might inform changes in their practice. I wanted to make sure that professionals were walking out of the room not just with information, but with specific plans on how to serve our community and the entire secular population better. As I brought the session to a close, I encouraged participants to take with them copies I had made of the chapter entitled, “The Nature of Secular Grief,” from my short book, The Secular Grief Support Handbook. After the session ended, a number of people approached me to talk about my presentation and their thoughts on the topic. I would love to tell you what they had to say, but honestly, I was a little emotionally overwhelmed, and don’t remember much. I do remember that they were interested and appreciative and to a one intended to let go of assumptions and better serve their clients who are nonbelievers. They seemed particularly touched by the words of the Grief Beyond Belief community. Of course, I realize that the attendees who chose to attend my session were the ones already inclined to want to better serve those grieving without faith. But that’s a good place to start. The best news is that within hours, people who attended my session were using different language to speak about beliefs at the conference itself. The keynote speaker who closed the first day of the conference himself told me that after attending my session, he had changed the language he used in his talk to remove language about spirituality and replace it with more inclusive wording. This was a doctor who works with terminally ill children and their families. The exact kind of professional I myself encountered and depended on while my son lived and died. Seventy people are just a drop in the ocean of professionals who terminally ill and grieving nonbelievers encounter in their times of greatest need. What I am hoping is that this one presentation will have a ripple effect; if even a few of those who attended share what they have learned with colleagues, its impact will multiply. I’m also hoping that I get to do this again and again. If you support this project and have connections in the field — particularly at universities where counselors, therapists, doctors, nurses, and particularly chaplains are trained to care for the grieving — please email griefbeyondbelief@gmail.com.